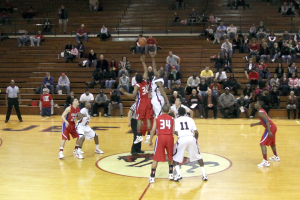 Kokomo and Lafayette Jefferson tip-off for the 100th time in boys high school basketball. LAFAYETTE – In what remains as one of the longest rivalry games in Indiana high school sports, Kokomo and Lafayette Jefferson squared off for the 100th time in 100 years last Saturday evening at the Crawley Athletic Center. And for the 54th time, the Wildkats came out on top of the Bronchos 62-59. But the outcome was not the story as these two teams battled each other in a series that began in Kokomo’s ninth year of playing basketball – the 1911-1912 season. McCauley said he was disappointed when the Bronchos chose to leave the North Central Conference and break up what was then a spirited conference rivalry. Jeff left the NCC in the spring of 2003 and joined the Hoosier Crossroads Conference in an effort to save travel expenses and travel time. Lafayette Jeff had a strong tie to the North Central Conference, having won 10 basketball titles – its first coming in 1935. They shared the conference title in its final year of play with Kokomo and New Castle. But now, thanks to the end of single-class basketball in Indiana – the Kokomo versus Lafayette Jefferson rivalry has turned from a conference rivalry to a tournament rivalry. Since the start of multi-class basketball, Kokomo and Jeff have squared off six times, with each team winning three contests. The Kats knocked Jeff out of the sectional last year, 68-51. As for the 100th meeting between the two teams, Jeff jumped out to an early eight point lead, but the Kats battled and grabbed an 18-16 lead after one quarter – a lead they would not relinquish. Indiana All-Star candidate D.J. Balentine led Kokomo with 24 points, 14 of which came in the first quarter after Jeff started hot. He also had a team-high six assists. LaBradford Sebree added 15 points and Tayler Persons tossed in 12 points – all in the second half. Rashad Richardson had 23 points and 13 rebounds for Lafayette – and McCauley noted that they will have to play better defense on the Jefferson star if they meet again in March. Until then, McCauley is happy with the way the rivalry series is progressing as the Kats have won five out of the last six meetings after Lafayette had won nine out of 14. This entry was posted in Balentine, Basketball, High School, IHSAA, Indiana, Lady Kats, Lafayette Jefferson, Sectionals, Wildkats. Bookmark the permalink.